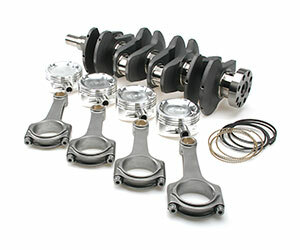 The BC stroker kit for the Honda/Acura K Series engine platform incorporates the wider B16A bearing (.935" width) that offers more surface area than the .740" width bearing found in the OEM K Series crank and rod combination. The added surface area increases bearing life, especially at extended rpm. Note: This kit requires custom connecting rods (modified BE bore and BE width). BC 4340 billet steel crankshaft (92mm or 95mm stroke). BC 4340 ProH2K or Pro Series (ProH625+) connecting rods featuring ARP premium fasteners.